Unbelievable-Aubrey, you rock! I want to be like you when I grow up:) Not only are you smart, you have such a strong desire to do good, to teach others, and set a great example to not only your sisters, but to your Daddy and I. Keep learning the Articles of Faith-you have already conquered the 13th which is the hardest! We love you. For anyone interested in reading all of the Articles of Faith, click here. And for anyone interested in learning more about our church and our beliefs, click here! That really is amazing Aubrey. What precious girls you have. I am at my son's house helping them with their new baby. I just got to a computer for the first time tonight. I am so sorry to read about your miscarriage. I was so hoping and praying that you would be alright. I am sad for you. My heart goes out to you. I just send you an email before I read your blog. I was still hoping you were ok. I am sending lots of love your way. I wish that I could say something to take away the hurt. I know that I can't but know that you are in my heart and prayers. So Sorry Dear Holly. May God bless you and comfort you. I hope you have a wonderful weekend. I want you to know that I'm sorry about the crap friend thing. 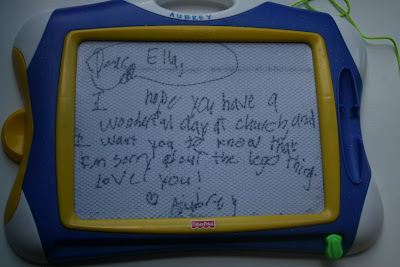 Aubrey is such a smart girl, and she is so sweet to write out an apology to Ella. You've taught those girls well; you're such a good mommy! :) Have fun on your date tonight. Holly, your girls are a wonderful example to me of great parenting. You and Joey are doing such a wonderful job with them and it shows, in all the little ways that they care for each other and for you. I know things are not always "perfect" but they are pretty wonderful all the same. I send love and hugs sweet friend. You have such special girls and have taught them so well. It is amazing how valiant these young spirits of the last days are. It brought tears of happiness and gratitude to picture them sitting on Ella's bed and looking through the scriptures. We all have truly been blessed with your sweet children!! Your girls are sooo sweet! You and Joey are doing an awesome job with them. How sweet Holly. What a great message to have. 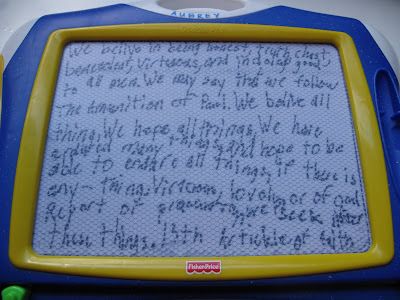 On a magna doodle. The toy that keeps on giving. Now those are great memories... girls are too fun! But it is because they have such a great mother. Love ya! What cute girls...and smart too! Those are the moments that make being a mom worth all the junk that comes along with it! Article of Faith good for you Aubrey keep up the great work. You are most definitely awesome.